An unforgettable AAA grade Rougui tea from the Wuyi Mountain. 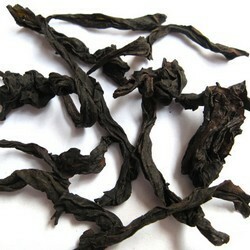 This roasted oolong was harvested from the Big Rock in June 2009. The word Rougui means Cassia Bark - a common culinary herb found in Chinese kitchen. Another popular translation is Cinnamon. Since Qing dynasty, he was famous for his intense, piercing aroma. For a high grade, the pleasant sensation is often described as honey, peach and miky. Few Ruigui teas were cultivated in the 1950s. Today, he is one of the most widely cultivated, alongside Dahongpao and Shuixian. The question is how did he rise to the top? Remember, he has many rivals, including thousands other Var Bohea tea plants in Wuyi! First, rinse in hot water to remove the "fire". Admire the brewed liquor. It is transparent amber with a golden luster. Taste the liquor. It is smooth and mellow, with the initial astrigency disappear after two infusions. Can you feel the lively and fresh sensation in your mouth? The aroma peaks at 3rd to 4th infusions. Can you smell the cassia, honey and peach in your upper palate? How about the milky fragrance? They are strong, but don't tend to last as long as the Dahongpao. When you are done, pour out and admire its wholesome leaves. The wet leaves are soft, fat and thick. Can you spot the three colors: green, brown and olive? How about the uniform red borders? Do you think the oxidation process has been done well?